Charles Dickens (7 February 1812—9 June 1870) was one of the great English writers of the 19th century. Charles Dickens was born in Portsmouth, England. His parents were John Dickens (1785-1851), a naval pay clerk, and Elizabeth Barrow (1789–1863). When Charles was twelve years old, his family moved to Camden, London. He worked in a blacking factory there while his father was in prison for debt. Dickens's hard times in the factory served as a foundation of ideas for many of his novels. Many like Oliver Twist soon became famous. When his great-grandmother died and transmitted money, Charles' father paid off his debts and was released from prison. Charles did not like working and wished to stop working after his father was released. However, his mother said that the family needed the money so Charles was forced to continue working. Charles then finished his schooling, and got a job as an office boy for an attorney. After finding that job dull, he taught himself shorthand and became a journalist that reported on the government. Dickens was a Unitarian. Charles Dickens was once involved in a train crash near Stapleford, Kent. His first book was Sketches by Boz in 1836, a collection of the short pieces he had been writing for the Monthly Magazine and the Evening Chronicle. This was followed by The Posthumous Papers of the Pickwick Club in 1837. Both these books became popular as soon as they were printed. 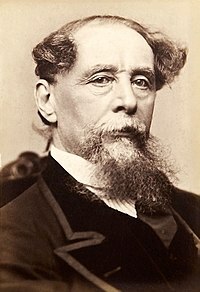 Charles Dickens died of a stroke on June 9, 1870. He was buried in Poets' Corner in Westminster Abbey. ↑ 1.0 1.1 1.2 1.3 Lansbury, Coral. "Dickens, Charles (1812-1870)". Australian Dictionary of Biography On Line Edition. Australian National University. Retrieved 2010-03-16. ↑ "Charles Dickens". 25.uua.org. Retrieved November 30, 2013. ↑ Cousin, John W. (1910). "Charles Dickens (1812-1870)". A Short Biographical Dictionary of English Literature. University of Adelaide. Retrieved 2010-03-16.